Shortly after arriving in Philippines, President Barack Obama held talks with President Benigno Aquino and was later to attend a state dinner. 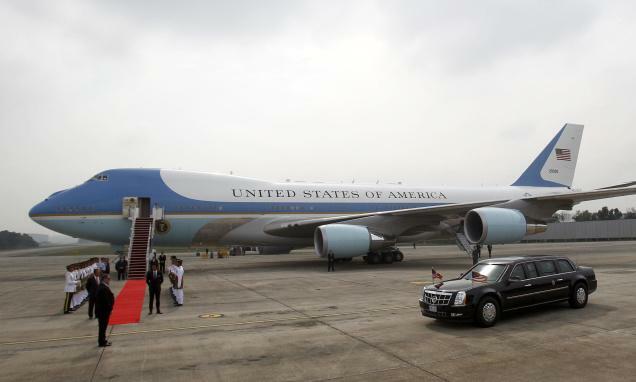 Manila is the final stop of the US president’s four-nation Asia tour. President Barack Obama says that a new US-Philippine military pact will promote stability in the region. The deal, signed in Manila hours before Barack Obama touched down, allows a bigger US military presence in the country. Barack Obama said the deal was not intended to contain China, with whom Manila is embroiled in a bitter territorial row. But he backed Manila’s move to seek UN arbitration over its maritime dispute with Beijing. “Our goal is not to counter China. Our goal is not to contain China. Our goal is to make sure international rules and norms are respected and that includes in the area of international disputes,” he said. The 10-year military deal was signed by Philippine Defense Minister Voltaire Gazmin and US Ambassador Philip Goldberg on Monday morning. Under the agreement, the US will have better access to military bases, ports and airfields. US troops would rotate through these facilities and engage in joint training, officials said. Barack Obama said the US was not planning to rebuild old bases or construct new ones under the security pact. “We’ll work together to build the Philippines’ defense capabilities and work with other nations to promote regional stability such as in the South China Sea,” he said. In a statement, Foreign Secretary Albert del Rosario described it as “milestone in our shared history as enduring treaty allies”. “The EDCA [Enhanced Defense Co-operation Agreement] elevates to a higher plane of engagement our already robust defense alliance,” he said. However, the presence of foreign troops is a sensitive issue in the Philippines, a former US colony. Anti-US activists who say the deal will not benefit the Philippines and harms its sovereignty were expected to protest during Barack Obama’s visit. The US used to have large bases in the Philippines but these were closed in the early 1990s. US troops have also been active in the southern Philippines, where al-Qaeda-linked militants are based. In recent months, however, Washington and Manila have moved to strengthen ties again, as the Philippine relationship with China has deteriorated amid a more assertive stance from Beijing on its territorial claims.